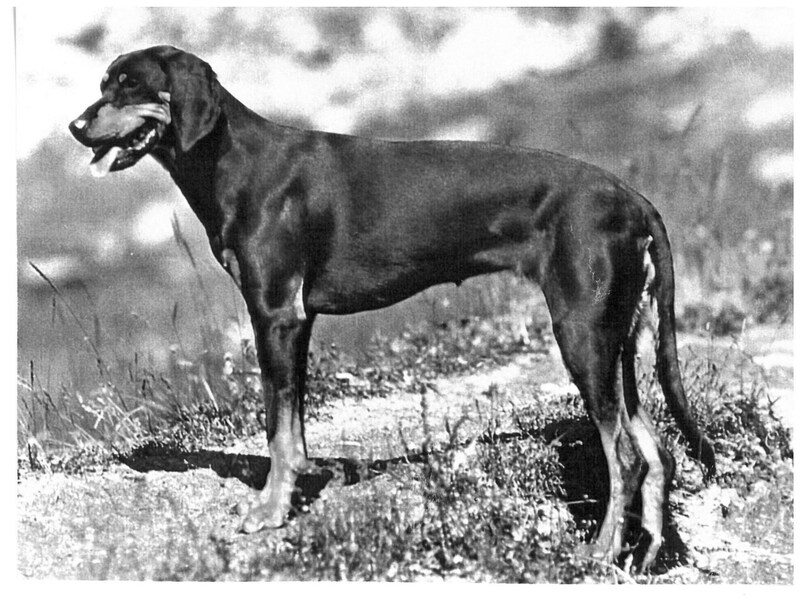 : The Black and Tan Austrian Hound is an universally popular hunting dog on account of its special suitability for heavy work on high mountains as well as on flat country for hunting by giving tongue and for the tracking of wounded game. : The Black and Tan Austrian Hound (Brandlbracke) counts as a true descendant of the "Keltenb racke" (Celtic Hound). As with all breeds of older origin, there is no definite authentic history for the "Brandlbracke" until the middle of the 19th century. The reason for this is that until that date nocontrolled breeding took place. : Medium size. Strong, long cast, supple body. : Sensitive nose; giving tongue, above all, for hare; tracking firmly and willingly with agreeable temperament. : Skull broad. Occiput barely defined. : Strong. Straight nasal bridge. : Well developed, close fitting, pigmented throughout. : Clear, dark brown, not showing any red in corner of eye. : Of medium length, not too broad, set on high, rounded at tips, hanging flatly. : Medium length. Very strong. Dewlap not desired. : Falling away in slight slope. : Long, tapering gradually, slightly bent. Pendant in repose. Coarse hair on underside, but without an obvious brush. : Well developed. Legs straight and strong. : Well laid back, well muscled. : Strong, round, arched; toes fitting close together. Nails strong and black. Pads large and strong. : Slim, moderately developed, long. : Smooth hair, close fitting, dense, full, resilient with silky sheen. Length approximately 2 cm. : Black with small, clearly defined light to dark fawn markings. The two fawn markings above the eyes (Vieräugl) must be present. Leathers folded, too pointed, narrow, short. Tail too short, too thick. Tail carriage bent too far upwards, lack of coarse hair on underside. Under or overshot mouth ; more than two missing premolars 1 or 2. Any other colour than that stated. Lack of well defined fawn markings above eyes (Vieräugl).